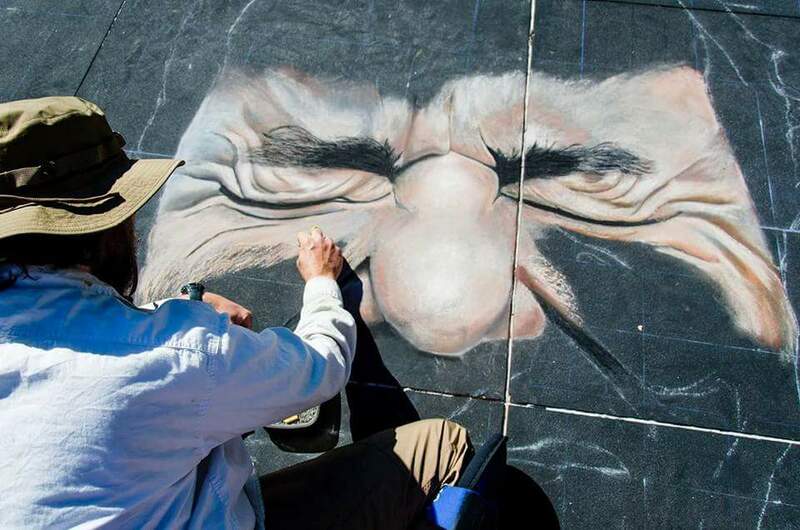 Ken Mullen has been chalking on the pavement for almost half of his life. Whether working alone, with his children or as half of street painting duo, the Chalk Guys,” he loves to zone out and get lost street painting under a pair of headphones. When working alone, he often enjoys the intimacy and detail of creating portraits, while as a Chalk Guy, he also has the opportunity to create large, whimsical 3D pieces as well. Ken has enjoyed being able to travel for his art and has had the honor of meeting many fellow chalkers across the USA. He hopes to continue the fun, and share his love of street painting for years to come. Ken’s favorite thing about Chalktoberfest are the people. From the superb event organizers to the receptive and thankful crowds, and some of the most talented chalk artists in the world, Chalktoberfest is a pleasure from start to finish.